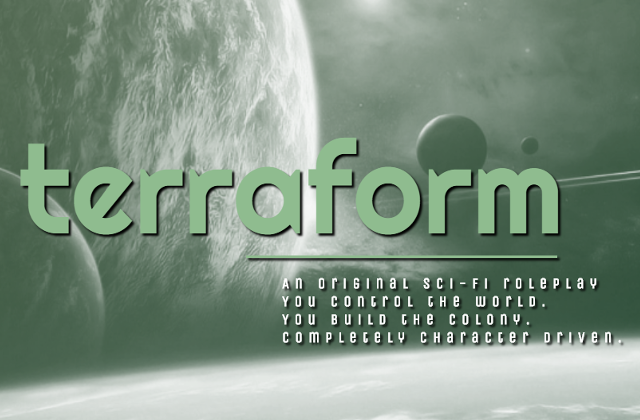 TerraformMI99 is a unique sci-fi roleplay environment in which you make all the choices for the world, the colony, and the development! When Earth becomes dangerously over-populated, and resources are so depleted that pockets of our world are simply unliveable, the ones to come to our aid are the conglomerate corporations we have come to rely on for everyday products and day to day life. One hundred and fifty colonists have been sent from earth with no heirarchy, no true structure, and only a vague idea of what they’re walking into, not to mention the promise of the first clear sky and natural plants and animals any of them have seen in their entire life. With only a hub, finite resources, and an entire planet five times the size of earth to explore, it’s up to the players and characters to find new locations, add them to the RP, and build the colony. What will be first? Where will you go? How many are going to survive being the first to step foot on Aeon-753c?